The other side of the game. Ma’at. Balance. Reciprocity. Full cooperation. Beautiful skin. Bridging the gap. Harmonize. It’s a Love Thing. Affirmative action. You & Yours. The Most Beautifullest Thing In This World. Smooth Operator. All the ladies in the place with style and grace. The Diplomats. Getting Married. The Beautiful Ones. “For the record, I love you.”, Come share my love. Share my world. All I need is you. You’re all I need to get by. Love Language. The Beauty Within. Back and Forth. Let’s talk about our love. Half & Half. Love Jones. All in love is fair. Beautiful morning. One on one. Allure. Many of us who are familiar with Astrology and it’s language immediately recognize the name Liz Greene. Liz is a psychologically oriented Astrologer whose insights I find to be astoundingly valuable and poignant. Some of her seminars, through the Centre for Psychological Astrology have been transcribed and converted into book form, which I find to be an excellent idea. During one of the workshops about the Sun Signs, there was a particular exchange between Liz and a member of the audience which reignited my feelings about Astrological stereotypes. During the lecture, Liz was discussing the needs of the different Sun Signs and she arrived at Sagittarius. She went on to ask the audience their thoughts on what the sign wanted out of life. The usual answers such as “meaning” and “purpose” were immediately offered up and Ms. Greene began to expand on them by mentioning the Sagittarian need for holistic understanding through intuitive realizations, making connections and so forth. What’s important about this exchange is the reminder of how Astrology can imprison our psyche as well as liberate it. When thinking astrologically, it’s a necessity that we’re able to distinguish behavior from sign. It’s equally vital that we’re able to separate the behavior of one person, or even a few, from the inclination to attribute that to an entire zodiac sign. When we begin our thinking with these kind of inaccuracies, it only stands to reason that the final result will prove to be misleading. However, if we’re more concerned about being “right” and confirming our suspicions about certain signs, then this mentality may prove to be comfortable for those who aren’t inclined to put forth the time and effort needed to make accurate distinctions. In closing, we also must remember that all of us are made of the same energies, but they’re arranged in a pattern which gives us our uniqueness. So, any information we think we’ve unearthed about another sign, could just as easily be applied to us as we have to a greater or lesser degree the same needs and drives which pervade our psyches. Let’s de-program our astrological minds. Reference: Apollo’s Chariot: The Meaning of The Astrological Sun, by Liz Greene pp. 59-60. 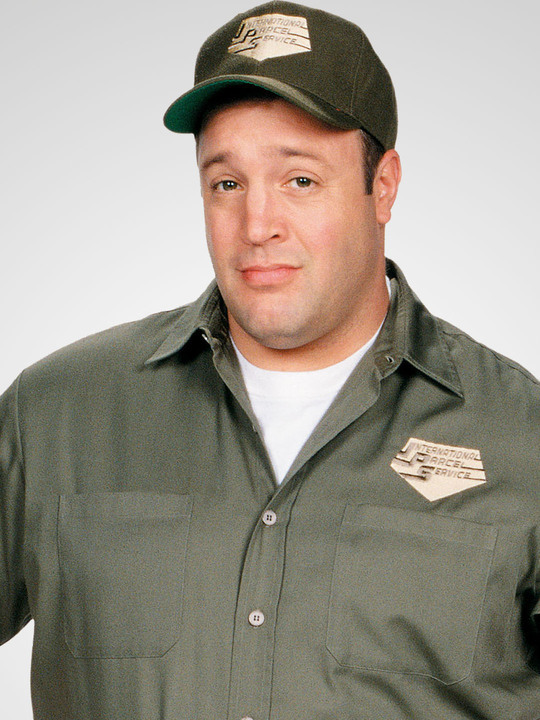 If you’re not familiar with the name Doug Heffernan, he’s the character who was played by Kevin James on the now defunct comedy series “King of Queens”. On a personal note, I think this show is hilarious and the character of Doug definitely goes a long way in illustrating the Taurus Archetype. Granted, there are many ways in which an astrological archetype can be expressed. However, Doug’s character unearths a lot of what we know about Taurus in it’s most basic form. In a birth chart, when the Sun is placed in Taurus, the fuel which stimulates the individual is that which is geared toward keeping things as they are. Basically, a tranquil life with no real surprises. Maintaining the status quo and things as they should be. The tendency is to gravitate toward what’s known because it brings a sense of comfort and security. On the show, Doug’s character is a driver for the fictional company “IPS”. He’s been there for a number of years and likes his job. In short, he’s comfortable. He goes to work every day, clocks in , delivers his packages and then comes home to his wife Carrie. Admittedly, Doug has voiced no passionate ambition to climb the ladder at his company, but rather to do the best he can in his current position. For the most part, his character suggests a Man of even disposition with not a lot of highs and lows. He’s relatively easy to get along with and has friends who enjoy his company. In fact, he’s had the SAME friends for a really long time, so the stability factor is there:gravitation to the known and familiar. Doug has a regular hang out spot called “Cooper’s” where he meets up with Deacon Palmer, who is his co-worker and best friend, his Cousin Danny and Spence, who is Danny’s roommate. It’s fair to say that Doug can be counted on to do what he says he’s going to do. He comes home every night and lives in relative peace with Carrie despite some of the mishaps and adventures which pervade the household. Doug’s character also illustrates the dysfunctional side of Taurus. In most cases, unless it’s serving him directly, he’s very reluctant to try anything that’s not familiar to him. There are several episodes in the show where this attitude is evident. I’m going to be astrotyping the rest of this cast soon, as it was one of my favorite shows. Beauty Jackson. Solid as a rock. Rock steady. Around the way girl. The nature. The pleasure principle. My mind on my money, and my money on my mind. Drop a gem on em’. Flowers. Touch it. Habitat. The Cash. I love the dough. Get Money. I’m out for presidents to represent me. Physical Stamina. Beautiful Skin. Play it safe. No time for fake ones. In the flesh. Material girl. Show me what you got. Money on the clock. All about the benjamins. Sensual seduction. Real eyes. Mostly the Voice. It’s all real. Revenue Retreivin’. The Natural. You gots to chill. Loyalty. Ain’t a damn thing changed. Jewels. Let’s chill…… let’s settle down. Comfortably numb. Take your time. Simply Havin’. Enchanted Lady. I don’t wanna ill, I just wanna chill. Now you’re mine. Does this man REALLY need an introduction? The answer is no. 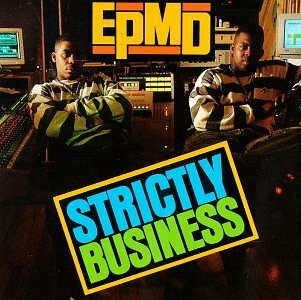 However, I’m going to give him one out of the immense respect that I have for what he’s done to life the art of hip hop to a higher level. 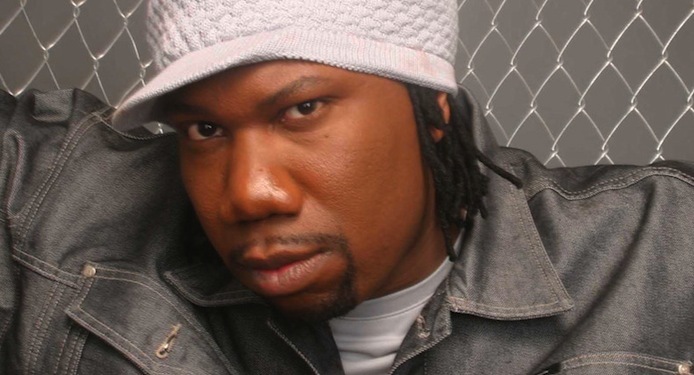 Yes, ladies and gentlemen, THIS is the Blastmaster KRS-ONE . Born on August 20, 1965, he represents the Sun sign Leo. The essence of Leo is permeated through the uninhibited expression of our most unique selves. Just as the lion has a territory, the human Leo needs a kingdom. The corner that he/she has carved out into the world through full utilization of their talents so that they may feel regal and special. Some may view this as too much ego, but the lions and lioness’ of this world simply affirm and recognize their own greatness. The hearty dose of self-confidence which they’ve been imprinted with since birth doesn’t hurt either. Leo’s know that without a doubt, they’re one of a kind. Part of their unique life task is to choose a creative endeavor and then shine. To lead. To serve as symbolic heat, light and energy to inspire and ignite others. Leo is ruled by the Sun, and if it were not for the solar force, what would the world be like? One of the most important lessons that Leo needs to learn is that there’s indeed enough light for everyone. Allow others to claim theirs just as you claim yours. Most people that know me well are super aware of my interest in both astrology and hip-hop. I believe the parallel is fascinating. Every chance I get, I try to fuse the two languages together to “decipher the code”. 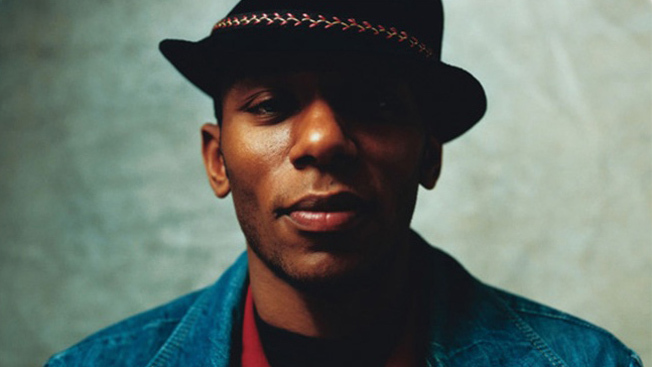 In fact, the more I listen to some of these emcee’s, the more I “see” or hear their zodiac sign shining through . This will probably be a continuous series, but I’ve put together some examples of various artists who are speaking astrologese, and may not even recognize it. However, this Astrologer does………. To a Sagittarius, the journey or quest is just as important as the destination. There’s no doubt that Yasiin is going to put his heavy bags down and relax when he comes home, but like the typical Sagittarian, he is now absorbed in his journey and wants to learn and broaden his mindas much as possible while on it. Unfettered by distractions or heavy emotional demands. It rarely gets more Sagittarian than that. Good afternoon. First of all, I want to assure you that reading this letter is worth your time. I’m well aware of your disdain for small talk. Please excuse me in advance if I happen to come off a little on the casual side, as I’ve also been informed about your penchant for formality. What I want to say to you is this: sometimes, I think you get caught up infear and doubt and tend to forget your strengths. You have some amazing ideas. And, they aren’t the “pie in the sky” variety, they’re extremely practical and down to earth. Something that, givenyour capacity for focus and concentration could easily manifest itself as tangible form in the physical world. Don’t be afraid to be “wrong“. You’re more than competent. As a matter of fact, if your thoughts and ideas are something that resonate from deep within your being, how can narrow, limiting labels such as “right” or “wrong” even be placed on them? Just know that I see your potential. I’m waiting for you to construct the mental framework as a prelude to building the prosperous reality of which I know you’re fully capable. I know it’s not easy for you, but you’re well equipped for the slow, steadyclimb to the mountain top. Your patience is enviable and your determination steady. Do you realize that you have the potential to emerge as the standard bearer for consistency through your thoughts and communication? People can say what they want, but just from talking with you I know the capacity to be clear headed, ambitious, goal oriented and conscientious of how you spend your time is alive and well in your bloodstream. I don’t think your mind needs too much more sharpening, it only needs to incorporate the tools of focus and organization for you to be on your way to success. With a work ethic like yours and the importance that you place on taking responsibility and the integrity of mind, I would be proud to associate myself with you. Take care, and best wishes on your quest to transform the ideal to the real. Recently, I watched “The Adjustment Bureau”, a film starring Matt Damon, Emily Blunt and Anthony Mackie. As I often love to do, I started looking for connections. The threads that would unite the general theme of the movie and the Astrological philosophy which I will share, quite enthusiastically to anyone who has the desire to know. After watching for a while, the light bulb went off. I love it when that happens. First, I would like to give everyone a general overview of the film. While it’s not complete, I think it should be fitting enough to move us in the direction in which we’re headed. In the movie, Matt Damon plays David Norris, a New York Congressmanwho’s making a run for Senate. While his campaign starts off promising, he ultimately loses momentum at the end, resulting in a convincing defeat by his opponent. 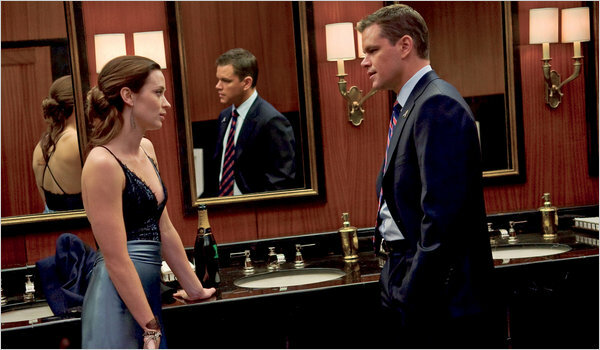 While rehearsing a contrived and robotic concession speech in the hotel Men’s bathroom, he’s shocked to find Elise (Emily Blunt) pretty much lounging and taking in his disingenuous remarks. They talk for a while and make an instant connection. It’s really as if they’ve “met” before on a higher, more ethereal level. Emily seems to be able to see right through David and to put it mildly, he’s captivated. Unfortunately, the object of his inspiration has other problems. Elise makes a hasty exit, as she’s being chased by hotel security for crashing a wedding. In other news, their interaction compels Mr. Norris to go out and keep it real with the people during his speech. Instead of what he was practicing, David delivers an address full of heartfelt authenticity. Ultimately, his remarks serve as the platform to seeking the same senate seat three years later. This time, emerging as the front runner. One month later, David, who’s now employed , but engrossed in campaign activities, runs into Elise on the bus. This time, he doesn’t half-step and gets her phone number. He’s determined to maintain contact, for he wants to regain the feeling that was established in their initial meeting. 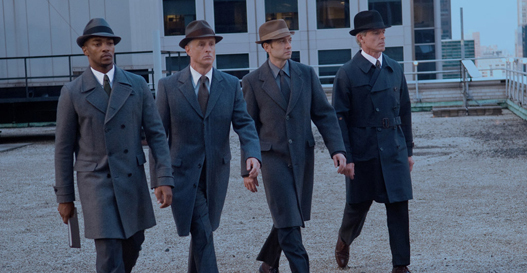 David arrives at the office feeling ten feet tall only to find all of his co-workers frozen and some strange men in suits and hats giving his immobilized campaign manager a thorough once over. Simultaneously perplexed and fearful, Mr. Norris tries to flee, but his attempts are unsuccessful. He’s immediately disabled of his strength and taken to a warehouse to become better acquainted with the intruders. Harry Richardson (Anthony Mackie) explains to David that these men are from “The Adjustment Bureau”. That essentially, their job is to make sure that the individuals they target stay “on plan”, and if they have to intervene in their lives to make certain this happens, so be it. Much to David’s chagrin, he’s given the information that it’s not in the plan to see Elise ever again. For good measure, one of the men goes into David’s pocket, removes Elise’s phone number from his wallet and hands it to another man to be burned. Unwilling to give up, David takes the same bus for three years with hopes of encountering Elise again, and by Jove it finally happens!! 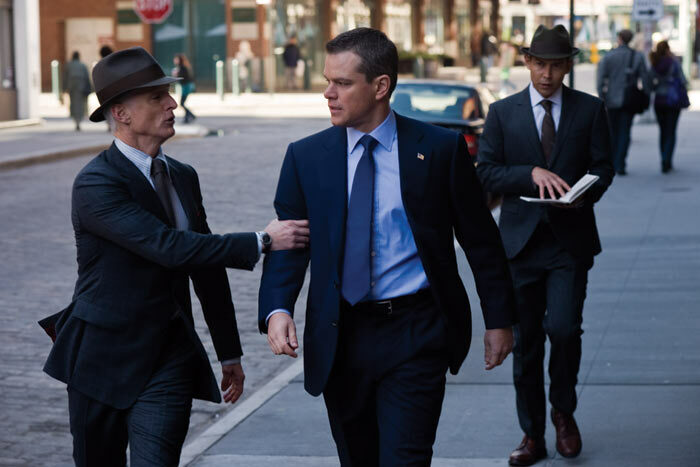 However, by this time, the adjustment bureau has it’s claws in deep. They’re immediately alerted and are on David like white on rice, doing everything in their power to agitate both of their schedules so they will be unable to see each other. To throw them totally off track. Of course there’s more to the plot, but this propensity to disrupt, as to not allow David and Elise to be together because “the plan” says so, continues throughout the entire movie. So, where does astrology enter the picture, you ask? In my eyes, the whole “Adjustment Bureau” symbolizes a very static and rigid view of Astrology. One which reduces us to a few key words and phrases which are supposed to describe our behavior patterns, temperament, etc. The stultifying approach that keeps us “on plan” for being a Scorpio, Taurus, or having Mars in the 9th house. The microwave cookbook version of what we have to look forward to because we were born in mid-December. The type of astrology which will have us believing that there’s only a couple of ways to express or live out the potential of our planetary placements and aspects as indicated by our individual birth charts. Just as the universe demands something out of each and every one of us, we must in return, demand from it. In actuality, it is US, who controls our plans based on our level of desire to live an authentic life free from the external dictates of others. We must do the work of self reflection. The intellectual labor which helps us decide if a certain life direction resonates with us or not. The more we buy into conforming to someone else’s “plan”, we are deadening our ability to practice free will. We must be courageous enough to seek more than these astrological cookbooks tell us. It really comes down to how much we want to work to realize and actualize our birth potential. Yes, we use our birth charts as a tool, but we have the final say as to the manner in which we express the ingredients in the recipe. Let us not forget that there are a myriad of ways to express Sagittarius, Cancer and Leo. There is no book, astrologer, etc. that can ever cover all of these possibilities. There is no doubt that it would benefit us all by having a competent, caring Astrologer provide us with a comprehensive overview and analysis of our birth charts, but no matter what prognosis we receive, it’s still up to us to act. To create a container for significance. To devise a wholistic life perspective which can accomodate all of the seemingly random bits and pieces of information. We can and must create meaning in our lives. At the conclusion of the film, when it was throroughly demonstrated that both David and Elise wouldn’t let any obstacle stand in their way to keep them from obtaining their ultimate goal of being together, the adjustment bureau rewrote the plan to include them. I encourage every one of us to engage in deep, meaningful and transformative dialogue with our individual astrological adjustment bureaus. Adjust your fate. Establish YOUR plan. A Message From Sagittarian Mind !! 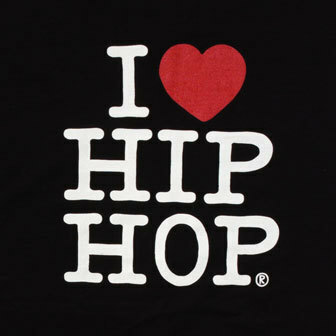 Greetings to my fellow Astrology and Hip Hop lovers !! Sagittarian Mind is making the transition to Word Press. You can expect the same dope content! !